Features: These sets are very helpful in modeling different Inorganic compounds. 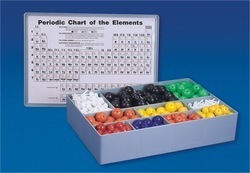 We offer to our customers Atomic Model Sets, which consist of moulded balls of different colours and sizes with connecting lugs of different sizes. These sets are very helpful in modeling different organic & inorganic compounds and are offered in junior sets and senior sets. 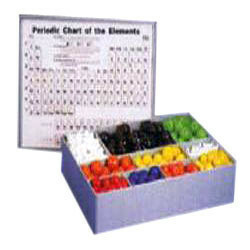 This Atomic Model Set (Euro Design) consists of moulded balls for different colours & sizes. Along with connectors of different sizes. This sizes & shapes of the balls & connecting lugs have been designed in accordance with internationally acceptable standards. Available Different Sizes: Student Set, Teacher Set. Aplastic modelis aplasticscale modelmanufactured as akit, primarily assembled byhobbyists, and intended for static display. A plastic model kit depicts various subjects, with a majority depicting military and civilian vehicles. A kit varies in difficulty, ranging from a "snap-together" model that assemble straight from the box, to a kit that requires special tools, paints, and cements. Model to generate a cardioid. Made of Acrylic sheet. Catering to the requirements of our clients, we are offering Plastic Tower 3D Printer Model. With our specialization in this domain, we are able to provide a superior quality range of Industrial Plastic Door Switch Cover Mould. The provided range is customized on different specifications. These sets consist of moulded balls of different colours and sizes along with connecting lugs of different sizes. These sets are very helpful in modelling different organic & inorganic compounds..
A model rocket, also known as low power rocket, is a small rocket designed to reach low altitudes (usually to around 100–500 m (300–1500 ft) for a 30 g model) and recovered by a variety of means. They are constructed of paper, wood, plastic and other lightweight materials. Model rocketry is a safe and widespread hobby. These sets consist of molded balls of different colors and sizes along with connecting logs of different sizes. These sets are very helpful in modelling different organic & Inorganic compounds. They are available in Senior as well as Junior Set. Material is of Polystyrene.